14 Details You Probably Didn't Notice In The Last Season Of "Black Mirror"
1. The White Bear logo appears briefly in the virtual-reality holes in the episode "Playtest." If you remember, White Bear was a reality show–style prison in which Victoria, a woman accused of kidnapping and murdering children, was publicly tortured. 2. In fact, that same case that Victoria was convicted and tortured for was the reason Blue, from the episode "Hated in the Nation," left her job. Ian Rannoch was Victoria's boyfriend, and helped commit the crimes that got her sentenced to appear on White Bear. 3. The same Victoria appears as one of the possible victims of the #DeathTo trending topic in the same episode. Although, looking back, a quick death from robo-bees might have been better than being harassed by men in masks for the rest of your (short) life. 4. TCKR is the name of the company that made both the horror game in "Playtest" and the "San Junipero" cloud. 5. In fact, on that same magazine cover there's a wink toward Granular, the killer robo-bee company. 6. Prime Minister Michael Callow, who got down and dirty with a pig in the first season of Black Mirror, appears in one of the news items in the episode "Shut Up and Dance". There's also an ad above the story for the intelligent cookie from the Christmas special episode, "White Christmas." 7. If you were wondering if Shou Saito ever gets caught for experimenting on humans, rest assured that he does not. In the final episode of the series, a news ticker reveals that he's actually doing very well. In fact, he's even got a new gaming system that he's announcing. 8. In that same episode, another news ticker reveals that the cookies from "White Christmas" have been granted human rights. 9. Yet another news ticker also gives us a clue about the chronology of the Black Mirror universe. This ticker announces the military program "MASS," which you may recognize from the episode "Men Against Fire." This means that the war on the "roaches" has not yet begun at this point. 10. The song that Raiman sings in the episode "Men Against Fire" is the same song Abi sings in the Season 2 episode "Fifteen Million Merits." 11. In the episode "Nosedive," one of the top-rated posts on the social network everyone is obsessed with is from a man named Michael Callow. And it's probably not a coincidence that he's upset about getting kicked out of a zoo, given his proclivities. 12. 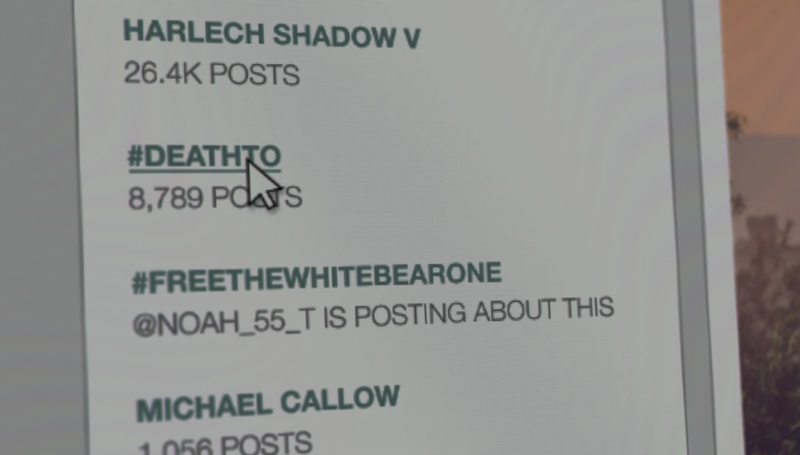 In the episode "Hated in the Nation," his name also appears as one of the trending topics, alongside a topic about freeing the "White Bear One." And a trending topic about Harlech Shadow V, which is the horror game series Shou Saito worked on. 13. Kenny, the main character from the episode "Shut Up and Dance," has a sticker of the Waldo character on his laptop. Waldo was the smart-alec bear character from the second-season episode "The Waldo Moment." 14. Most of Yorkie's '80s looks in "San Junipero" are clear references to popular movies and music videos of the time. From left: the first is the character of Allison Reynolds, from The Breakfast Club, the second is from the video "Addicted to Love" by Robert Palmer, and the third is from "Heart & Soul" by T'Pau.